Remember when rumors of a No Man’s Sky delay led to outrage, fan hysteria, and amateur detectives calling dozens of GameStops? Would you believe me if I told you the same thing just happened again? This morning, Square Enix announced that they’d delayed Final Fantasy XV two months to November 29 in hopes of optimizing and polishing the game as much as possible. This news came after an entire weekend of delay rumors that led to fans flipping out all across the internet, trying hopelessly to find proof that it wasn’t true. 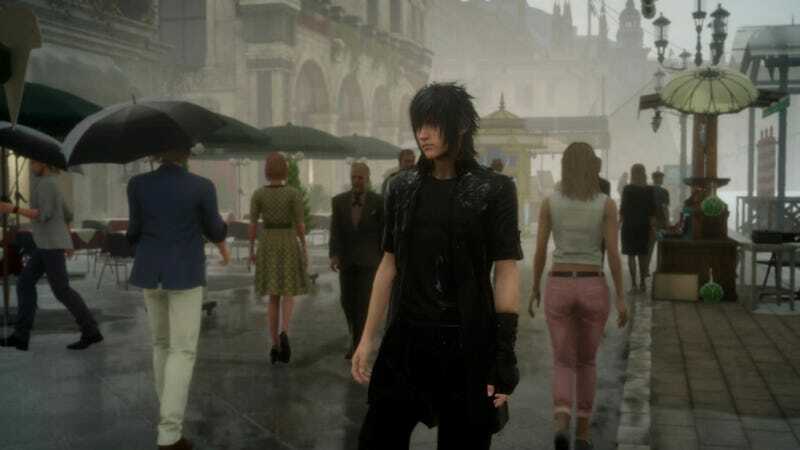 It started Friday night, when reporter Ben Lamoreux wrote on a little-known website called Gamnesia that he’d heard Final Fantasy XV was delayed to November 29. Citing a source at GameStop who had given him correct information in the past, Lamoreux said the delay would be announced on Sunday or Monday. Almost immediately he got a torrent of nasty messages from fans who didn’t want to believe the news. As the weekend progressed, Final Fantasy fans across the internet started looking for reasons to declare that the rumor wasn’t true. Upset about the thought of having to wait two extra months for Final Fantasy XV—and unwilling to put faith in a small site like Gamnesia—fans insisted that this was a hoax, that Lamoreux was lying to them. That after holding a big event just to announce FFXV’s release date, Square Enix wouldn’t dare delay it again. On Saturday, Gamnesia offered more evidence, publishing a photo of GameStop’s instructions for applying a new release date sticker to Final Fantasy XV marketing displays. Amateur investigators on Reddit immediately insisted that it was photoshopped. It got worse, though. On Saturday night, I confirmed that Gamnesia’s scoop was correct, posting both on Kotaku and on Twitter that I’d heard from a non-retail source that the delay was real. You might think that corroboration from Kotaku would help convince people that something was up, but instead, a whole bunch of Final Fantasy fans decided to double down on the idea that this was a big conspiracy to, uh, make them really mad? If you can’t trust 4chan, who can you trust? Meanwhile, over on Reddit, some suggested that the amateur detective squad start calling Square Enix’s offices. Some said they would cancel their pre-orders if this turned out to be true. Some said both. Voices of reason were downvoted and shut down. But hey, at least there were no death threats!